An all Chinese final, an all Japanese final or a mixture of both; those were the options that beckoned at the start of the Men’s Singles semi-final contests at the Seamaster 2018 ITTF World Tour Platinum Australia Open in Geelong on the evening of Saturday 28th July. It was the first preference that prevailed; Liu Dingshuo beat fellow qualifier Yuya Oshima (11-6, 11-5, 11-3, 11-8) to be followed by Xu Xin, the no.2 seed, who accounted for Tomokazu Harimoto, the no.5 seed (11-5, 11-8, 9-11, 11-5, 9-11, 11-7). Success for Liu Dingshuo in straight games, the young man who in late 2015 had won the Boys’ Singles title at the World Junior Championships in the French west coast town of La Roche-sur-Yon, was a margin of success greater than arguably expected. Presently on the Men’s World Rankings, Yuya Oshima is listed at no.50; Liu Dingshuo at no.140, a position that does not reflect the status of the 20 year old who is becoming ever more a most complete player with the distinct possibility of stepping into illustrious shoes. It was the first ever meeting between Liu Dingshuo and Yuya Oshima on the international scene; for Xu Xin and Tomokazu Harimoto somewhat different, it was their third in just over a year. Notably Tomokazu Harimoto has wins to his credit against Fan Zhendong, Ma Long and Zhang Jike, three players in recent years who have brought China the greatest honours the sport has to offer. The member of the illustrious group who remains elusive is Xu Xin, following their meeting in Geelong, he still remains elusive. In Geelong, true to best Chinese policy, Xu Xin was prepared for the task ahead. At the Liebherr 2017 World Championships last year in early June, Xu Xin had beaten Tomokazu Harimoto in five games (11-9, 6-11, 11-6, 11-8, 11-4), a relatively comprehensive win. 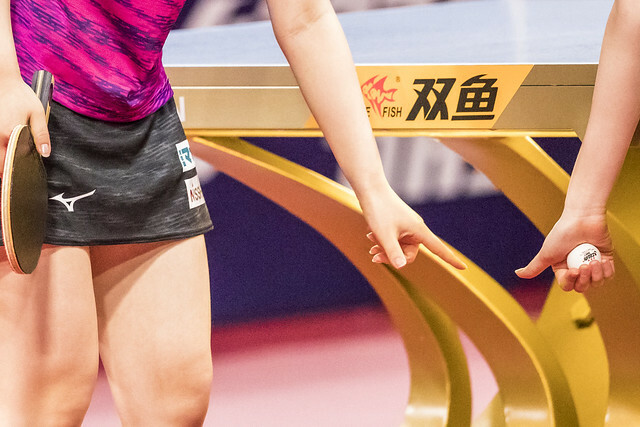 However, later in the year at the Seamaster 2017 ITTF World Tour Swedish Open in Stockholm, it was a very different story; Xu Xin came perilously close to defeat. He trailed by three games to one before recovering to win by the narrowest of margins in the deciding seventh (9-11, 4-11, 11-7, 8-11, 11-5, 11-6, 11-9). Xu Xin had learned from the Nordic experience. The final will be played on the evening of Sunday 29th July.